With the S&P just one big short squeeze away from all time highs and Q2 earnings for the most part blowing away expectations, the market has rarely looked as strong... and yet - as Nomura discussed earlier - investors are starting to get nervous: first Netflix, then Facebook, now Twitter: is the foundation starting to crack? 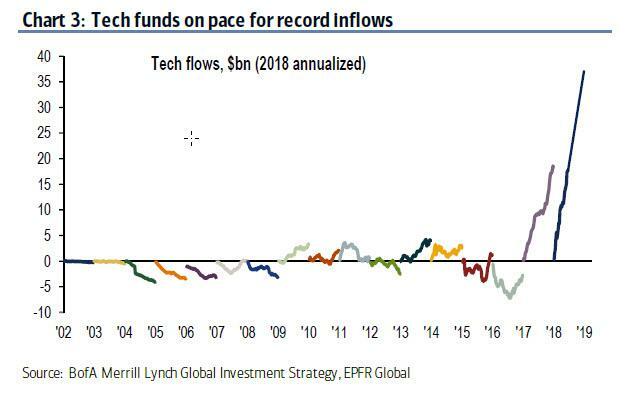 One wouldn't know it by looking at tech inflows which last week (before earnings by FB and AMZN) added another $0.6BN to tech funds, and now annualize an unprecedented $36 billion. 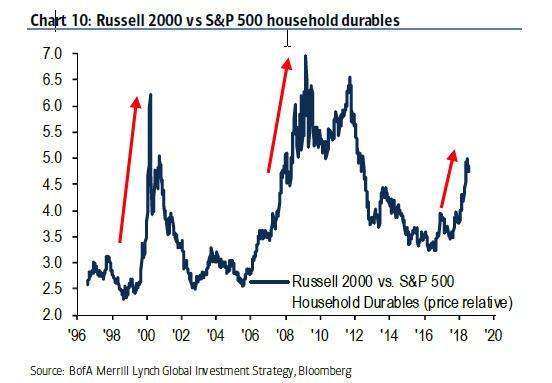 According to the latest Flow Show by BofA's Michael Hartnett, they better continue because in the era of QE, tech has been the market's true leader. 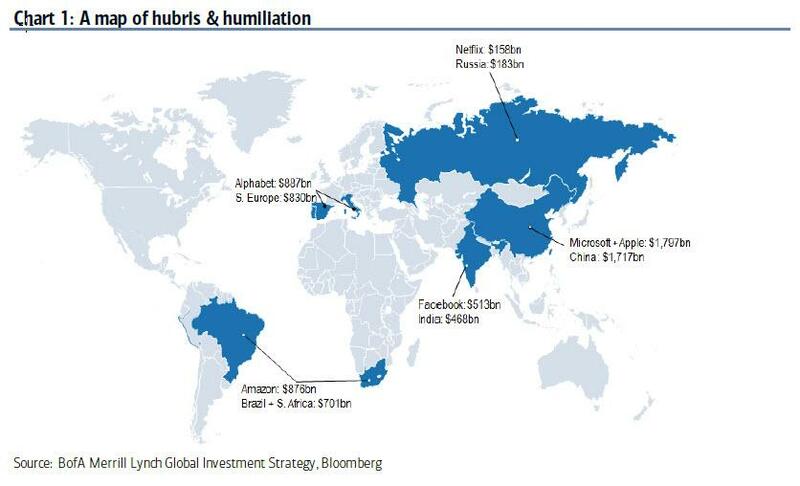 And even after yesterday's crash, Facebook market cap is (still) bigger than India (for some other GDP-tech comps, see the map below). FB shock classic “late-cycle” event…cult leadership becomes volatile & vulnerable as “liquidity” drained. To be sure, some central banks have already read the tea leaves, and going back to one of his favorite phrases, Hartnett writes that "markets stop panicking when policy makets panic." Nowhere is this more obvious than in China. As we have discussed extensively in recent articles, in the past 3 months Chinese policymakers have announced 2 cuts in Reserve Requirement Ratios, overseen 7% devaluation in CNY, enabled ¥1.1tn tax cuts, and greenlighted ¥1.35tn local government bond issuance. What is the cause of China's panic? 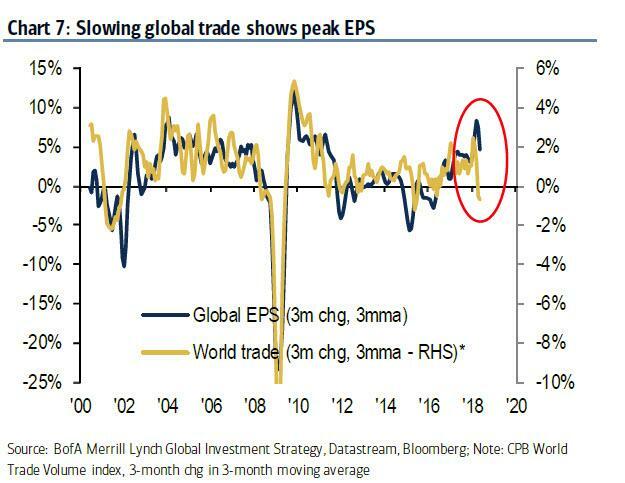 Why trade war of course, and not just fear of the unknown and what Trump may do tomorrow, but what is happening today: according to BofA, Beijing is reacting to a clearly recessionary trend in world trade activity, which turned negative in May, and as the chart below shows, this supports the global Peak Profits argument. ... 10-year Treasury yields still can’t breach 3% and global equities ex-US tech up just 1% in 2018. And as always, keep your eyes on US bank stocks: they are always the best tell. Hartnett's parting words of advice: "start buying bear market protection."